Has shopping drained your energy and pockets? If you’re in Lokhandwala market, head to Grub Shub, the latest eatery on the block that’s simplifying food to make it fast, convenient and easy on the pocket. Primarily known for fries and waffles, the idea behind Grub Shub’s menu is to take the dishes from the Indian palate and give them a western twist. For example, their waffles, one of the few savoury waffles in the city, are doing flavours like Madras masala waffle dosa (INR 79) served with three types of chutney, paneer bhurji waffle dosa (INR 89), chipotle mushrooms waffle (INR 149), and more. They also have a varied fries menu which includes imli chilli BBQ fries (INR 119), sweet chilli & sriracha fries (INR 109), cheesy makhana fries (INR 169) and more. 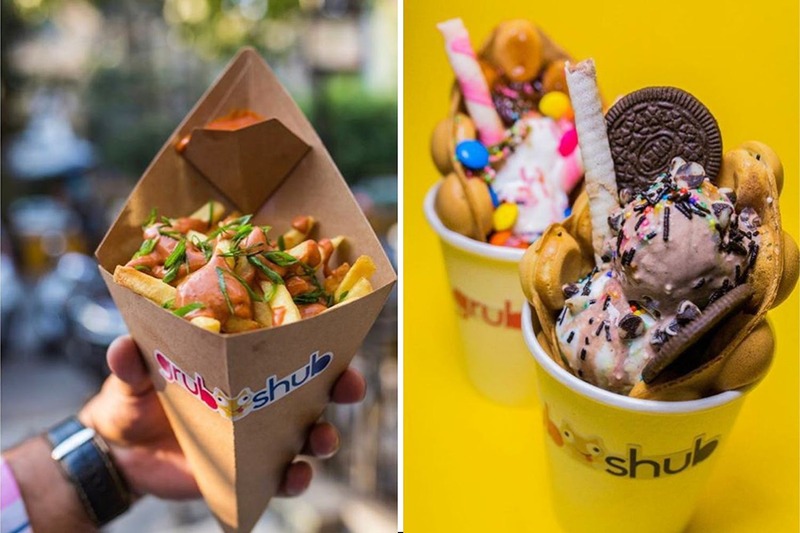 Other exciting things on Grub Shub’s menu are macaroni options, sweet Belgian waffles (INR 109 – INR 149) and bubble waffle sundaes (INR 209 – INR 229). To go with your quick bites, they have a range of ice cream soda floats, shakes and coolers that nail the taste and are refreshing. Try their Jalapeno lime spritzer (INR 129) which perfectly blends tangy and sweet. Thandai float and Singapore dragon, ice cream soda floats, is a crowd favourite too. No need to get your hands dirty. Just order something here, take it with you and fill your tummy on the go with Grub Shub.